The adjustable needle locking mechanism has two settings. If the needle is unlocked, it is released for azimuth readings. If it is locked, the needle is momentarily released for strike measurements. This occurs by pressing and holding the release mechanism. The needle is locked into a measurement when the mechanism is released. 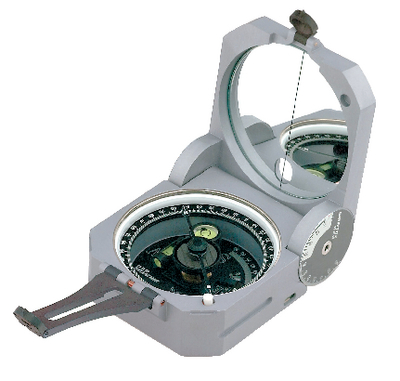 The transit also features two long-level bubbles on the outside of the housing for accurate leveling from the sides or bottom, “Buck Horn” style sighting for increased accuracy when sighting azimuth or vertical angles, and a hinge clinometer designed for durability with 2° increments for 1° readable dip measurements. The single NdFeB magnet resists demagnetization better than other types of magnets, the sapphire jewel bearing allows for smooth needle movement, and the needle is induction-dampened for quick, accurate readings. The magnetic declination adjustment allows for east or west declination settings to 180°, the precision aligned mirror has convenient “see-through” sighting capacity, and the ball and socket tripod mount is centered for increased rotational accuracy. The transit is waterproof, comes in a leather case, and has a lifetime warranty. SpecificationsAccuracy for both azimuth and vertical angle: ±1/2° with 1° graduations and 10 minute readability; Vertical angle measurements: up to ±90° or 100% grade; Percent grade scale: increments of 5%.